COPAG cards are considered by many poker players that to be the finest playing cards in the world. Made from 100% plastic, COPAG cards will last approximately 50 times longer than regular paper cards. This is a set of two poker sized decks (measuring 2 1/2 by 3 7/16 inches), different sizes are available. Poker size (63 mm) and Bridge size (57 mm), Jumbo index and Regular index. 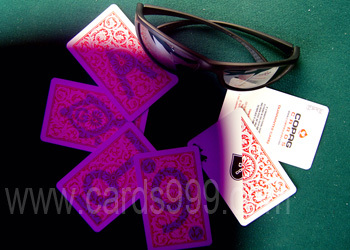 Different colors and patterns of the back, Copag marked playing cards can be marked in different ways, also can be seen by different infrared contact lenses according to the luminous ink kit. Blue cards:marked with big font in the middle back (white mark). Red and Orange cards: marked with big font in the middle or small fonts in 4 corners ( white or black marks). Actually, the performance of the red and orange cards will be better than the blue ones. UV marks and IR marks can be made, use our infrared or UV contact lenses for luminous ink to see the mark, also marked cards glasses. The history of COPAG is directly linked to the history of card games in Brazil. A pioneer in the manufacturing of marked deck, COPAG has been in this marked since the begining of the century. In 1908, Albino Gon Calves, a graphics designer, founded the company in the city of Sao Paulo. Since its inception, COPAG has maintained its position as the absolute leader in its market.